I’ve been a fan of Michael Perry’s writing for a few years now. 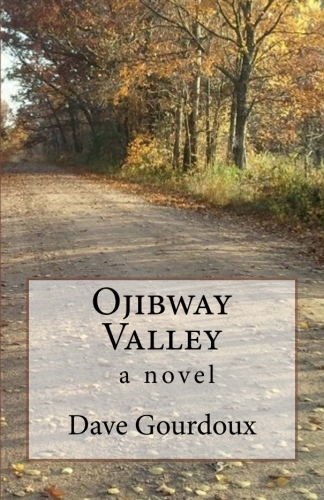 In books like Population 485 and Visiting Tom, he established himself as a master of the narrative personal memoir, chronicling life in the rural Midwest, telling personal stories of a vanishing people and the countryside they inhabit. His non-fiction works so well because he writes from the inside out; as a long time resident of the isolated small towns and farms that is his setting, he puts himself in the center of the narrative, and we see the world through his eyes. His books are a slow cooked stew of humor, nostalgia, tragedy and triumph all blended together and seasoned with his love of the northwestern Wisconsin landscape and his eccentric but decent neighbors, and served with prose that balances the humor and longing with the cadence and imagery of poetry. When I first heard that Perry was dabbling in fiction, I was intrigued. The stories he tells in his memoirs may be non-fiction, but they are stories none the less. Population 485 and Visiting Tom work so well because Perry has such a gift for keeping the narrative moving and breathing life into the characters, two elements crucial to writing good fiction. Fact or fiction, stories are stories, and story tellers are story tellers. For me, writing fiction has always felt like a more personal endeavor than memoirs. In memoir, one is always constrained by facts, by things that actually happened. In fiction, the only constraints are the limitations of your own imagination. By writing fiction, the writer creates new worlds, worlds that have to come from somewhere inside. It takes nerve to write a novel, to assume that you’re able to imagine and describe a setting and characters and a narrative that will justify the reader’s investment of the time it takes to read it. When I heard that Perry’s new book was not only fiction but a dystopian mid grade adventure, I thought, what could be further from the grounded reality and the reverence for the past that is Perry’s usual work? It’s as if he wanted to stretch beyond his comfort zone, to challenge himself, and he’s swinging for the fences on the first pitch. 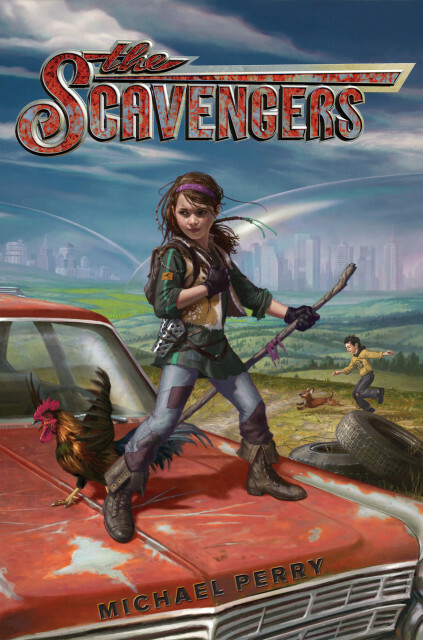 The Scavengers contains such highly imaginative elements as solar bears, “grey devils”, bubble cities, “scary pruners,” and huge crops of genetically modified corn. It describes a population divided by the dwellers of cities encased in giant bubbles and those who choose to live by their wits in the lawless wilderness outside the bubbles. These things aside, you don’t have to dig too deep to be reminded that this is still a Michael Perry book. First of all, the landscape, despite being charred and modified by climate change, remains unmistakably northwestern Wisconsin. Readers of Population 485 will recognize the town of Nobbern as the real life town of New Auburn. Setting is always vitally important to Perry. The Scavengers is set in the same latitude and longitude as Perry’s non-fiction, and while climate change has introduced new plants and animals and set the weather out of whack, Perry’s descriptive passages reveal the same love of nature. You can feel the night breeze, you can see and smell the green rolling hills, and you can understand and appreciate why the narrator, Maggie, a.k.a. “Ford Falcon,” loves living out bubble so much. The Scavengers may be set in the future, but that doesn’t prevent Perry from further exploration of one of the primary on-going themes of his non-fiction work: the relationship of the past to the present. The people who have chosen to live outside of the bubble are quite literally off the grid, and they have to rely upon their own creativity and what they can learn from whatever’s available, including an ancient and sexist but none the less helpful boy scouting manual written in 1880. Cell phones and computers and Face Book are nowhere to be found out bubble. Instead, Maggie learns to communicate with her neighbor Toad via semaphore lamps and other coded methods. Maggie and Toad make their living by scavenging junk yards for abandoned relics and trading them for food and clothing. They are quite literally living off of the past. Maggie, the twelve year old narrator and protagonist, is a remarkable and memorable creation. Strong, smart, independent, resourceful, and passionate, she is exceptional and unique, a true heroine. The story is told from her point of view, and we follow her, she is “on screen,” for every moment of the book. We learn about her relationships with her parents – her mother, who Maggie loves more than anything, as they bond via the poetry of Emily Dickinson and Earl Grey tea, and her father, who her feelings for are a bit more complex and ambiguous. He’s emotional, sentimental even, but is also strangely aloof and distant, easily driven to distraction. We eventually learn that he has a secret that Maggie has to draw out of him in a most unexpected way. Without revealing too much, it turns out that he played a key role in the events that led up to the creation of the in bubbles and out bubbles, and he’s a wanted man by government officials who are secretly combing the countryside for him. Maggie also has a little brother, Dookie, who appears to be developmentally disabled in some unidentified manner. Dookie represents one of the few missed opportunities in the book, as I never felt he was adequately explained or played an important enough role in the story (perhaps in the sequel Perry says is coming in 2015 he’ll play a larger part). A Michael Perry book wouldn’t be a Michael Perry book without humor, and there’s plenty here. There’s a psychotic rooster named Hatchet who is the bane of Maggie’s existence, attacking her at the most unexpected and inopportune times. There’s the character of the blacksmith in the town of Nobbern who loves to talk but hates to work; his long suffering wife does the work for the two of them and more but has nearly given up on getting a spoken word in. As in Perry’s memoir writing, The Scavengers celebrates the importance of neighbors. Maggie’s closest friends are an elderly couple who live a hill away, Toad and Arlinda Hooper, who at least slightly resemble Tom and Arlene, the elderly neighbors Perry wrote about in Visiting Tom. In one of the book’s constant ongoing sources of amusement, Toad loves wordplay and communicates almost exclusively in pig Latin and spoonerisms (like the wagon they travel to Nobbern to trade goods and battle “Grey devils” from is called the “Scary Pruner“, based upon the Prairie Schooners of the frontier days). Perry’s love of language is another thing to like about the book – the vocabulary and the refusal to dumb down the story to a younger audience. Perry has never shied away from the big words in his memoirs, and while the language in The Scavengers is less sophisticated, it’s only slightly so. I found myself having fun deciphering Toad’s coded messages, and I’m sure that bright children will get the same pleasure. I suspect that the book may even ignite a love of language in some of the readers. I haven’t read much mid grade fiction, so I assume that some of the things that seemed a bit off kilter to me are because of the intended audience. For example, at the start of the book, I had trouble understanding why such a close and loving family would let the children run free so much of the time. It’s one thing to let the kids run and play in the fields and woods during the day, but at night, Maggie sleeps in an old abandoned Ford Falcon at the bottom of the hill, separated from the rest of the family, in a landscape populated by carnivorous solar bears and the zombie-meth head–like creatures known as grey devils. Mom and Dad also sit at home while Maggie/Ford Falcon goes with Toad via the Scary Pruner on dangerous trading runs to Nobbern, where they have to fight off hordes of grey devils. Of course, Maggie is an exceptionally capable and tough little girl who knows how to take care of herself, and while I may take issue with some of her folks’ parenting decisions, I’m sure that the ten to twelve year old kids who read the book won’t think twice about it. The Scavengers should appeal to readers of all ages. Parents of middle grade age children can take comfort in that there are no swear words or profanity in the book. There are some suspenseful fights with the grey devils, but they are all pretty benign, with no gratuitous or graphic violence. There is plenty of adventure and action to keep kids engaged, and at the same time, the book is written at a level that will challenge them to think about things they maybe haven’t thought about before, like how they relate to their neighbors, to the environment, to nature, to their families. The Scavengers may have been written for children, but not at children. Perry treats his younger audience with the same respect he shows for the readers of his memoirs. John Updike once said, “When I write, I aim in my mind not toward New York but toward a vague spot a little to the east of Kansas. I think of the books on library shelves, without their jackets, years old, and a countryish teen-aged boy finding them, have them speak to him. The reviews, the stacks in Brentano’s, are just hurdles to get over, to place the books on that shelf.” With The Scavengers, Perry has written a book that will speak to boys and girls of all ages for generations. *Copy reviewed provided by publisher. All opinions are my own and I was not compensated in any way. A review worth reading. It is a pleasure to read a review that takes me by the hand and leads me to the story so personally that I now want to read it for myself. It is better than a preview. It is the next best thing to Michael Perry’s story itself. From your review I can feel the characters and see the scenery so closely that I want more. Thank you both Michael and Dave.